to help in the fight for justice, unity and peace. These inconspicuously stylish (MADE IN EUROPE) sunglasses conceal some top secret technology. An in-built chip produces a visualisation reminiscent of X-rays, enabling Captain Euro and the EUROPEAN SUPERFORCE team to see through a wall or detect concealed weapons immediately. They include wireless access and voice activated commands. Not to mention that they are a must have fashion item! 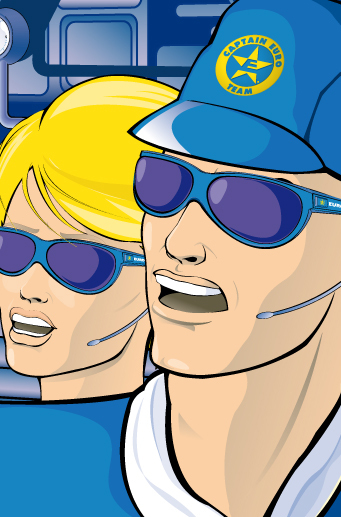 The most practical and sophisticated tool of communication ever developed, the E-WATCH [Enhanced Wireless Access Tech] is for the exclusive use of the CAPTAIN EURO TEAM members. 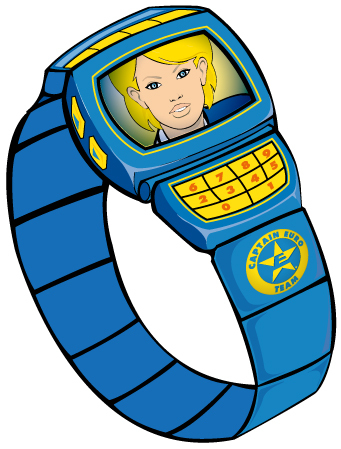 The E-WATCH is a wireless tele-communicator with an ultra high resolution indestructible screen. Using satellite technology, it enables members of the CAPTAIN EURO TEAM to communicate securely and access global data. And that’s not all! The E-WATCH also incorporates any number of useful APPS and gadgets, including a Geiger counter, a radar locator and a holographic projector. It also gives the time. This complete body suit is a multi-purpose uniform for the CAPTAIN EURO EUROPEAN SUPERFORCE TEAM. 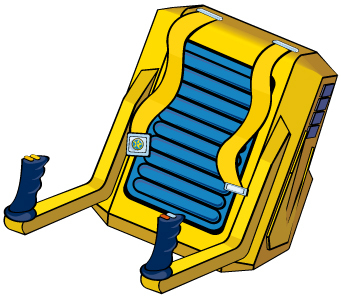 With additional accessories it can be used in space, under water or in radioactive environments. The EUROUTFIT is made of a lightweight, Kevlar based new thermal material which has been tested to protect immersion in volcanic lava for hours. It is suitably protective and comfortable in any kind of environment. Developed by ERIK, naturally, the exact location of the manufacturer is top secret. The EUROUTFIT sports a surprising air bag system designed to protect in any eventuality. 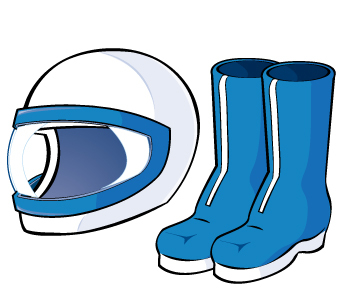 The boots incorporate a novel spring technology (activated by changeable password commands) which catapults the wearer several meters higher than they would normally be able to jump. Electrically or sun powered, EUROJET is sleek and deadly fast. It’s joystick controls are ultra-responsive. The Eurojet self assembles at the touch of a button – ready for use in any place, for any eventuality. Manufacturer: EURO INDUSTRIES secret labs. 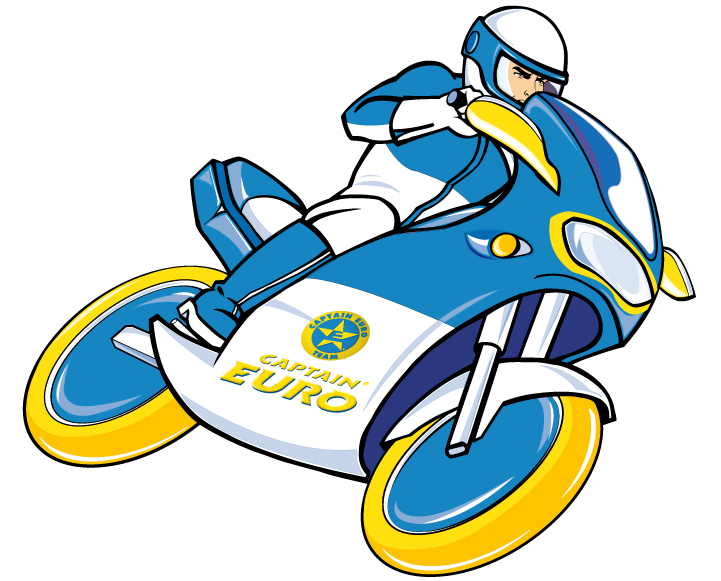 A tiny device of pocket size dimensions, the EUROSTUNNER is able to emit an ultrasound frequency with which the members of the CAPTAIN EURO SUPERFORCE TEAM can defend themselves from their enemies by temporarily paralysing them. It’s frequency setting can be digitally customised, according to use and situation. The Eurostunner has other facilities: it can emit a powerful laser beam which may be used as a steel cutter. Externally, the EUROCAR may resemble a classic European sport car, but beneath it’s impenetrable plexi-flurocarbonite bonnet it resembles no other vehicle. Employing secret experimental technology, it’s solar engine is the most powerful ever made and is the result of the joint efforts of various European car makers. 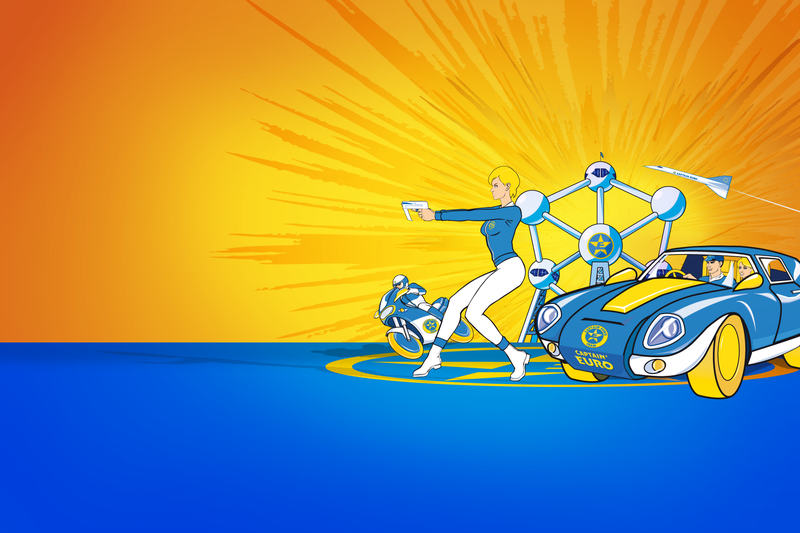 The Eurocar is uniquely successful in integrating Eco friendly car technology with dynamic performance. The Eurocar is able to reach speeds of up to 400 K per hour, it does not respect speed limits across Europe, but maximum power is reserved for extreme circumstances. ERIK, supported by MARCUS, is often to be found under the bonnet of the Eurocar, updating and incorporating the latest gadgets. The Eurocar is able to fly by deploying lateral wings. Zero Emissions vehicle. 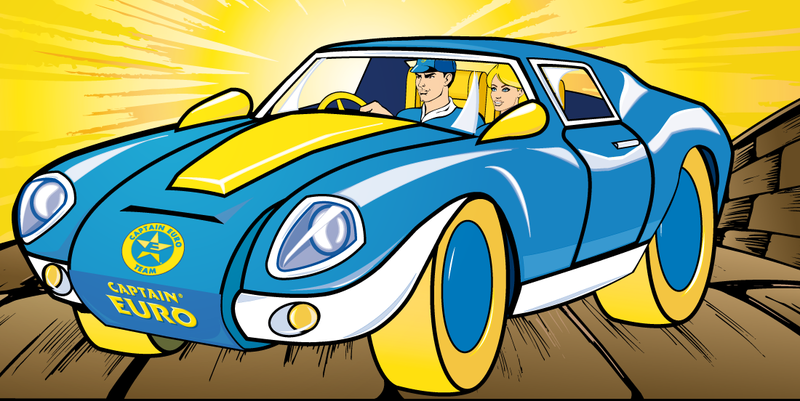 Fashioned from an advanced alloy, EURORACER seems to run at the speed of light. Like the EUROCAR, its engine utilises solar power, and contains remarkable new experimental ceramic materials able to withstand extreme temperatures. But wait! This versatile piece of hardware can be converted to travel over water and snow. 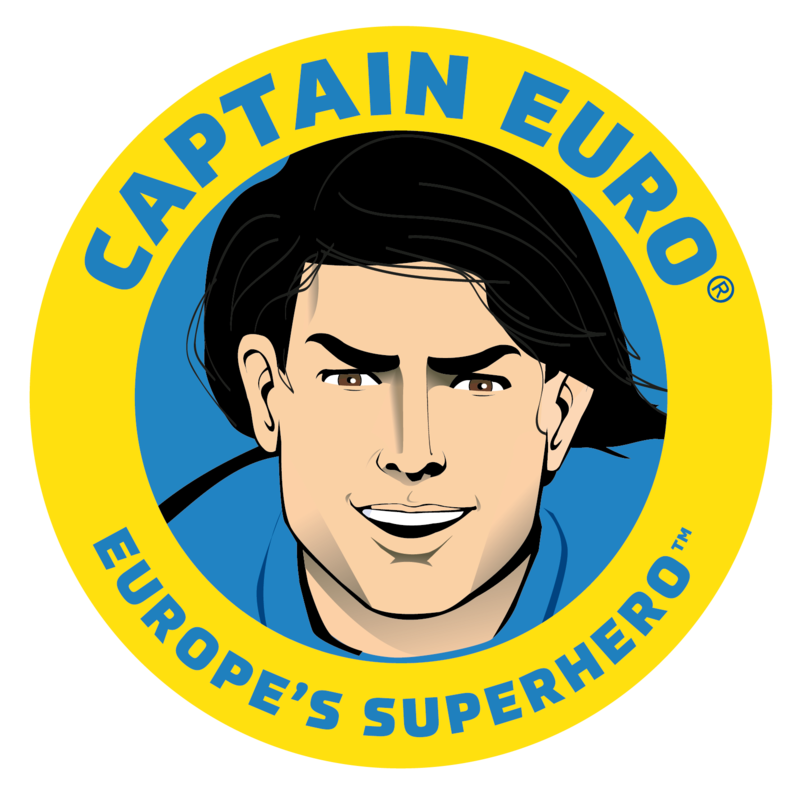 Each member of the CAPTAIN EURO EUROPEAN SUPERFORCE TEAM has a Euroracer, personalising them with their own particular devices and giving them special names. Euroracer zips across the landscape on tyres, constructed of a new kind of impenetrable rubber. Equipped with ultra-laser beams, it can slice through steel and concrete. With technology such as this, who needs roads? 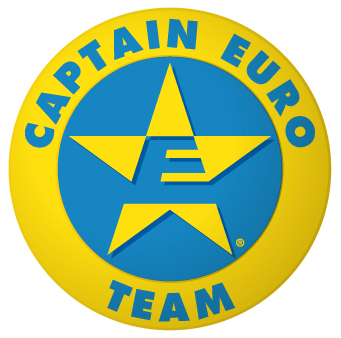 The PIN is the official badge of the CAPTAIN EURO TEAM. Each pin has the sophistication of an in built computer chip containing recorded information about the person who is wearing it. The PIN verifies access to secret basis and vehicles. Able to reach any depth, using sea water as energy, the EUROSUB is used for oceanographic exploration, rescues and adventure. The design of the Eurosub is based on the flowing lines of a dolphin. When it is not in use, this prototype submarine is kept in an underwater hangar just off the Mediterranean coast. The latest in aerodynamic efficiency and stealth sonic technology, the EUROCORDE is as noiseless as a butterfly. Its engine runs from a new secret energy source. Capable of MACH 3.5, the Eurocorde can make London to New York in minutes. Also able to take off and land almost anywhere, utilising VTOL technology, it can be used to carry the EUROCAR and other vehicles. 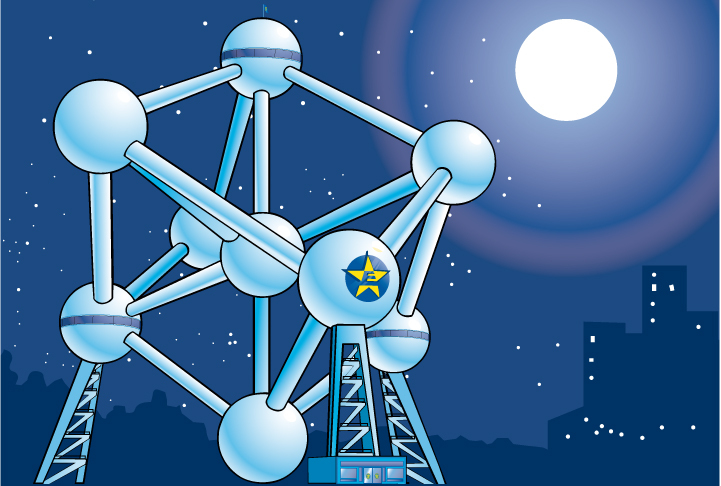 The ATOMIUM is one of the CAPTAIN EURO SUPERFORCE TEAM’S bases. It is the centre of a network of advanced communications and information technology.